Organizer Serena Sebring speaks before demonstrators symbolically offer to be arrested in solidarity with those charged in connection to Monday’s action. Photos by author. 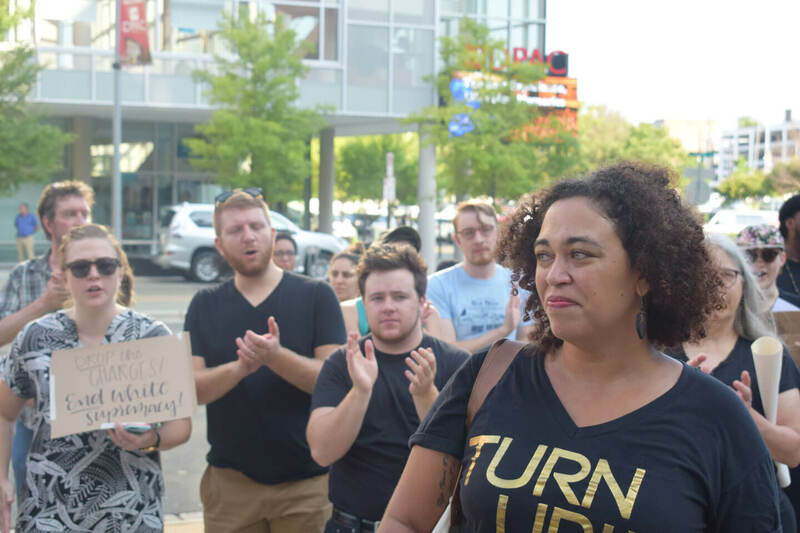 Reverberating clamor from a nearby construction site peppered the otherwise silent, muggy morning last Thursday as more than 100 local activists and organizers gathered outside the Durham County magistrate’s office, according to NC Policy Watch. Three days prior, dozens peacefully dismantled a Confederate soldiers’ monument commemorating “the boys who wore the gray” outside the county’s old courthouse on Main St. Now some of those people reassembled to call upon Durham County to drop the charges levied against several of the activists with outstanding warrants. They and other supporters offered to symbolically turn themselves in, but officers did not book anyone without an outstanding warrant. North Carolina Central University student Takiyah Thompson, 22, climbed a ladder last Monday to affix a bright yellow rope to the statue, allowing others to pull it down from its cement pedestal. “[The statue] glorifies the conditions that oppressed people live in,” Thompson said during a Workers World Party press conference Tuesday on the steps of a NC Central University building. Thompson is a member of the WWP, an anti-racist and anti-imperialist group. Authorities arrested Thompson at the press conference. Demonstrators protest police raids on activists' homes and demand the Sheriff's office drop charges against those involved in taking down Durham's Confederate statue. The organizers of Thursday’s demonstration said the action was intended to raise concerns about the severity of the charges, which included the felony of inciting a riot, and of the Durham County police force’s response to the direct action. It came in the wake of a deadly white supremacist rally in Charlottesville, Va. last Saturday, Aug. 12 during which Ku Klux Klan and neo-Nazi groups protested the removal of a Robert E. Lee statue from the University of Virginia grounds. Nearly a thousand people would rally on Durham’s Main Street a day later, after misinformed rumors spread alleging that Ku Klux Klan members planned to march downtown. According to the organizers, the would-be counter-protesters joined Inside-Outside Alliance members who gather outside Durham County jailhouse every Friday afternoon to show support for prisoners and protest police-violence. The diverse crowd overwhelmingly supported anti-racist and anti-fascist ideologies in a demonstration that aimed at the root of the issues that have compelled calls to tear down Confederate statues in Durham and elsewhere — namely continued white supremacy and the memorialization of anti-Black violence. Tuesday night, local ABC News reported that roughly 800 people gathered at McCorkle Place and Franklin Street to demand the removal of “Silent Sam,” a bronze Confederate statue erected in the main quadrangle of University of North Carolina at Chapel Hill’s campus in 1913. Chapel Hill police — many donning riot gear — arrested 19-year-old student Claude Wilson and protected the monument while university police arrested two individuals not associated with the university. Several students are now staging a sit-in around the statue until it is removed. Lamont Lilly, also of the WWP, helped to organize Thursday’s rally which seems to have galvanized anti-racists across the state. He told Thursday’s crowd that Durham County sheriff’s deputies forcefully raided his communal home after identifying activists via social media footage of the statute’s teardown. “They had a supposed warrant for the ladder that Takiyah Thompson climbed, but busting the door down and tearing up closets, doors, furniture and photographs — that was not the way to do that,” Lilly said. In response to the raids and to several warrants for arrests, dozens lined up outside the Durham County jailhouse to take responsibility for unseating the statue in solidarity, but sheriff’s deputies turned them away, saying they had committed no crime. Only those with outstanding warrants for arrest were booked on Thursday: Raul Jimenez, 26; Aaron Caldwell, 24; Elena Everett, 37; and Taylor Cook, 24. They joined four Durham activists who authorities arrested earlier this week: Thompson; Peter Hull Gilbert, 36; Dante Emmanuel Strobino, 35; and Ngoc Loan Tran, 24, who were arrested outside Thompson’s court hearing on Wednesday morning. All eight activists are charged with two misdemeanors (disorderly conduct by injury to a statue and damage to real property), a class H felony (participation in a riot with property damage in excess of $1,500), and a class F felony (inciting others to riot where there is property damage totaling more than $1,500). Thursday’s demonstrators also sought to pack a courtroom in support of Gilbert, Strobino and Tran, but Sheriff Mike Andrews chose to bar their entry, citing safety concerns. Later in the morning, passing cars honked in solidarity. In the crowd, hundreds cheered and chanted, “Thank you/ we love you,” in anticipation of Jimenez, Caldwell, and Everett’s re-emergence from the jailhouse. They, along with Cook, appeared in court earlier today. According to their lawyer, Scott Holmes, they are receiving death threats from Klan members. Not all onlookers were supportive of the activists’ demonstration. An alleged white nationalist militia member in plainclothes visibly looked on from a parking deck adjacent to the county jailhouse. Upon returning to their vehicles in a different parking deck after the rally, roughly half of the demonstrators encountered at least another three supposed militia members who peered with binoculars from the top deck. Sebring and other organizers expressed concern that these onlookers took photos of demonstrators and their license plates in order to target them. The overwhelming majority of Confederate monuments were erected during the height of Jim Crow laws and KKK terrorism as well as during the years of the Civil Rights Movement. It is ahistorical to suggest these statutes and commemorative artifacts are somber reminders of a dark but foregone Southern past; they were explicitly erected as part of broader campaigns of white terror. When those memorials are erected with public money or on public land, that terror is state-sanctioned. Gov. Roy Cooper (D) said he agreed Confederate monuments should come down — legally. A 2015 North Carolina law protecting “objects of remembrance” means municipalities are unable to remove statues without consent from the state legislature. Then-Gov. Pat McCrory (R) signed the law about a month after the Charleston massacre and activist Bree Newsome’s removal of the Confederate flag from the South Carolina state house grounds, which reignited national debate over Confederate symbols. Organizers emphasized that the destruction of the monument was an act of civil disobedience against the symbol itself as well as against the laws and politicians who continue to protect the white hegemony that those symbols commemorate. Lawyer Scott Holmes speaks in a press conference outside the courthouse on Thursday. After a press conference on Thursday, organizer Manju Rajendran urged supporters to donate to Thompson’s family. Supporters are encouraged to donate to the Durham Solidarity Center Freedom Fighter Bond Fund, which assists “those who act in good conscience to advance the cause of justice and equity” with paying bail bonds, according to the center’s website. Purportedly, Klan members swiftly reported a GoFundMe fundraiser for Thompson’s mounting legal fees as fraudulent, resulting in the host site’s removal of the campaign. Rajendran also encouraged supporters to “send direct love,” such as checking-in with others and simply exchanging hugs, a directive just as vital as keeping pressure on Cooper, Durham District Attorney Lynn Clodfelter and police commissioners.